Nearly the first thing I noticed about driving this car was the clutch. The seller told me he had changed the clutch but for some reason, the peddle would not come all the way up. 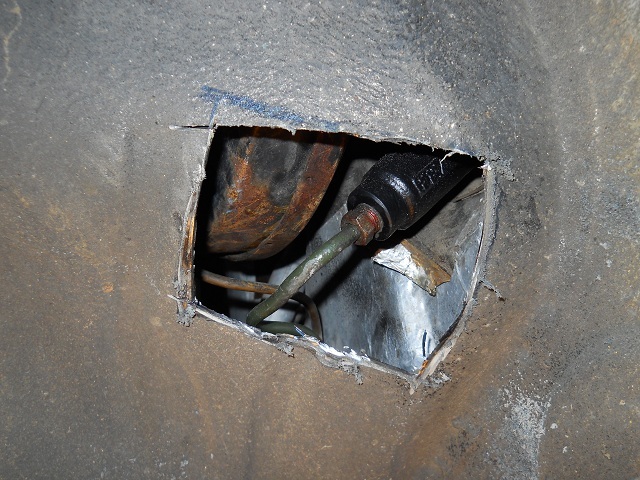 In the 944 world, clutch hydraulics are a common problem and I assumed this was the same situation. 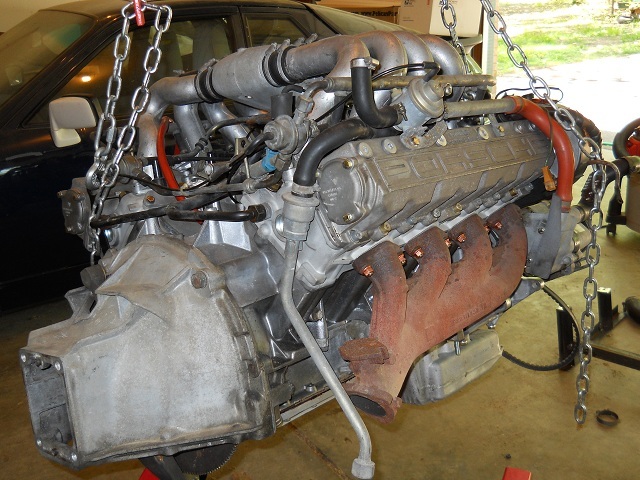 I had bigger fish to fry though with getting the engine sorted out and most of my effort went in that direction. I did get these pics as I was pulling the car apart though. 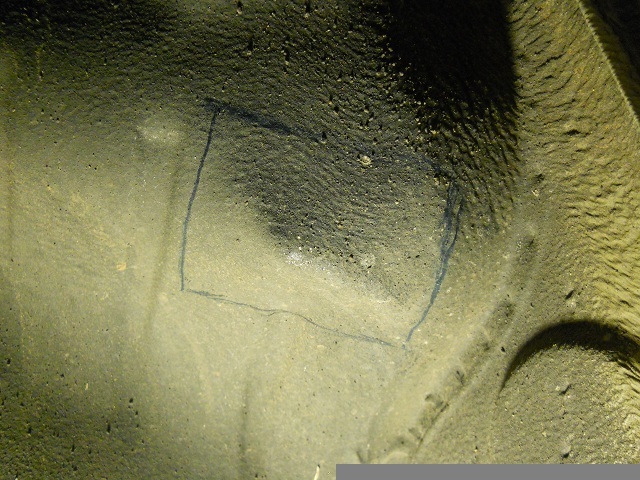 First the blue hose appeared to be original and munched on a little by mice. 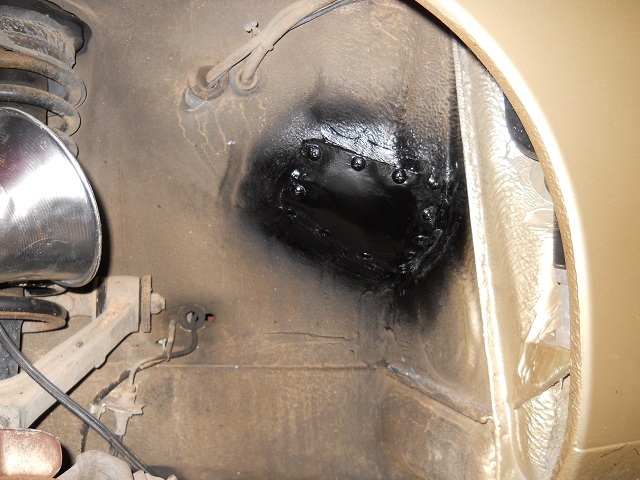 The rubber line that crosses under the oil pan has some heat damage and the slave seemed to be the original. Almost 12 months later... most of the engine work is done and I finally get the master cylinder out and find that it has a broken spring. 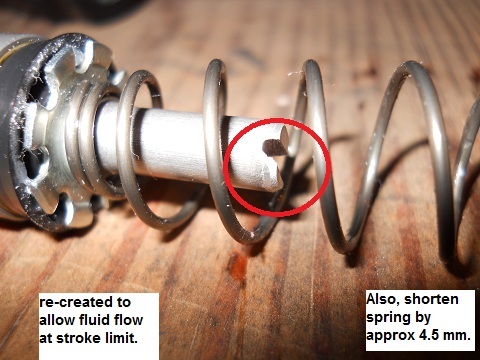 With some research, I'm getting the idea that the broken spring is pretty common. Maybe this contributes to the low clutch pedal, I'm not completely sure as there were other problems found too. I thought I would rebuild both the master and the slave but good deals came along and I got both of parts as new items for pretty cheap. Side note: the rebuild kit for the master cylinder is over $30, a new unit is available from Pelican for $80. It seems that Porsche somehow set out to change the master cylinder to a different model in an effort to fix the breaking spring problem. The new MC has an extended piston pin that prevents full depression and thereby protects the spring from full compression. The problem is that without a full stroke, the dual disk clutch doesn't completely release. 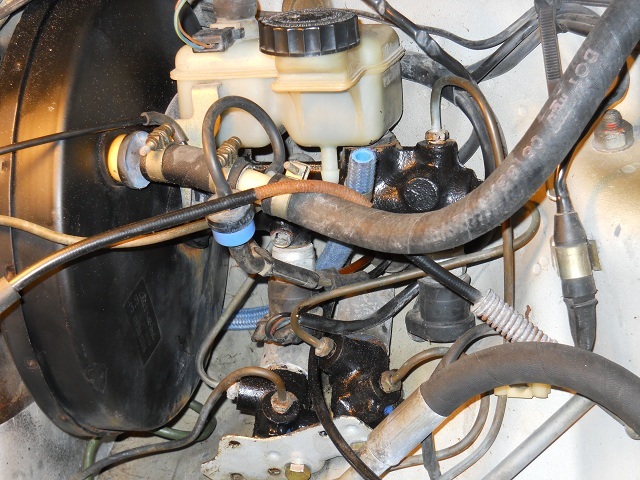 At the outset, I 'm thinking I may just move to a 951 master cylinder to stay away from the limiting pin. 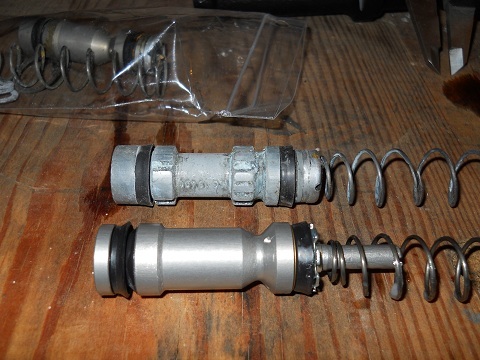 Here's a pic of the original 928 master cylinder (broken spring) versus a 951 MC, its very similar and I was thinking I might just fix-up one of my old 944 cylinders. 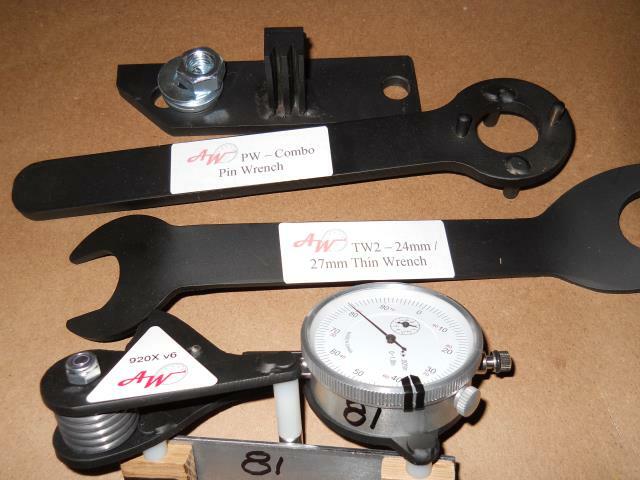 And here's a pic of the original 928 master cylinder (upper) versus the new replacement, note the limit pin. 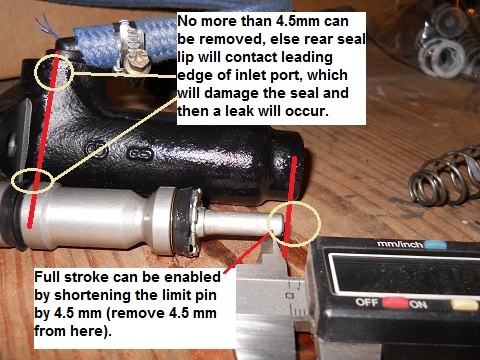 So, I read that the new limit pin can be shortened a bit to regain full stroke. It seem logical, I sure hope this works. After cutting off the 4.5 mm, I re-created the notch and shortened the spring too. Getting the master cylinder back into the car is a real pain, here, I have the brake booster pulled out to access the master cylinder area better. With the booster out, I did a little cosmetic touch up on the booster's paint work (I could have done so much more). Also, note the windshield is out. I still haven't bled the clutch (engine is still out) so the outcome of the Merlin mod is not yet verified. 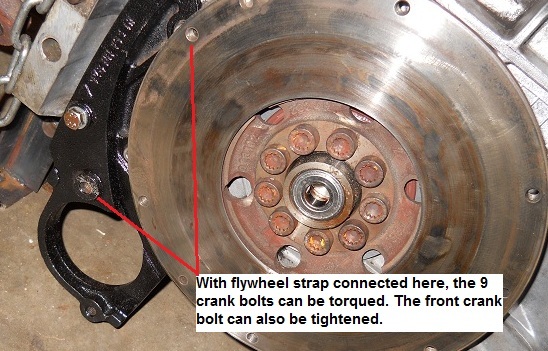 Aside from the dual disks, the 928 clutch is not so different than others. There are a few assembly tips though having to do with keeping things in balance so I was glad I read through the WSM ahead of time. 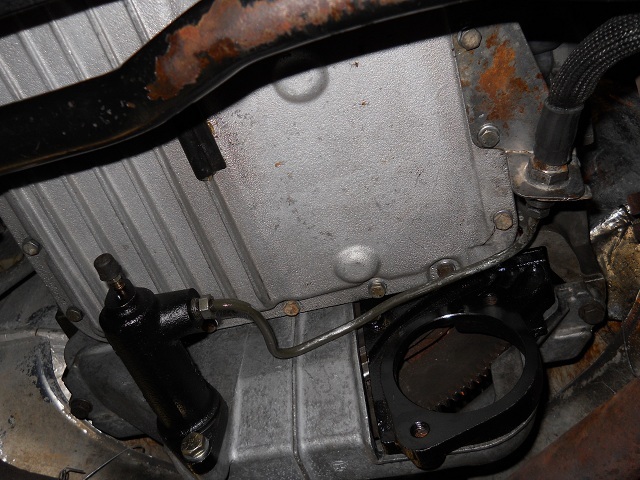 Even if there is a problem though, the way the clutch is joined to the engine and torque tube makes for easy removal (ok, relatively easy - no engine or trans pull required). There are not many areas of the 928 that are easier than the average car to access but the clutch is one of them. Clearly the flywheel and intermediate pressure plate were not machined when the clutch was replaced and I may regret it but went ahead and put it back together with these parts. If it turns out I have problems, I'l pull them back out for some clean-up. I've used this small slide hammer many times to pull pilot bearings, simple and easy. 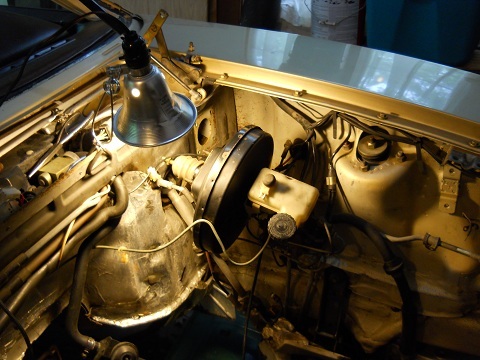 Side note: this is the perfect time to attach a simple steel strap between the flywheel and the the starter bracket. With that strap temporarily attached, the front crank bolt can be torqued. Same for tightening the nine flywheel bolts. 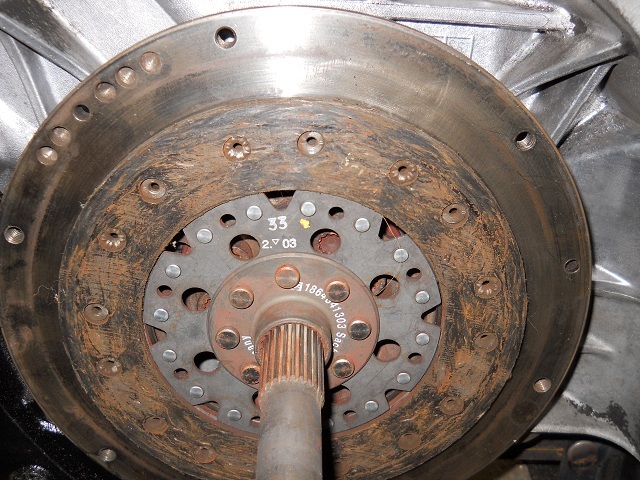 One of the alignment tips involves the placement of the clutch disks. The yellow dot on this disk represents the heaviest point around the perimeter of the disk. The other disk, also has a dot (white). The two dots need to be on opposite points (one at 6 and one at 12 o'clock). Here, you can see the sleeving I added to the clutch hose - I wish I had taken a few minutes to quick powder coat that bracket though. So now the engine is all in, finally got the clutch hydraulic line routed right, got the brake master back in and I'm ready to pull a vacuum on the line but all I get is a steady stream of bubbles. That was when I realized that I had left the clutch master fitting loose. After some thoughtful vocabulary, I decided a more direct access to the clutch master was needed. Hack seems like a better way to describe this than mod. 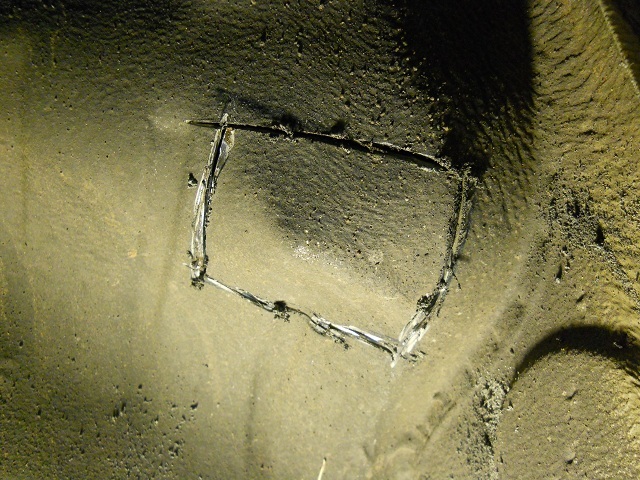 Only someone that was seriously pissed about the access problems of this area would resort to cutting a access hole. But, thats what I did. It was surprisingly easy and fast to do. 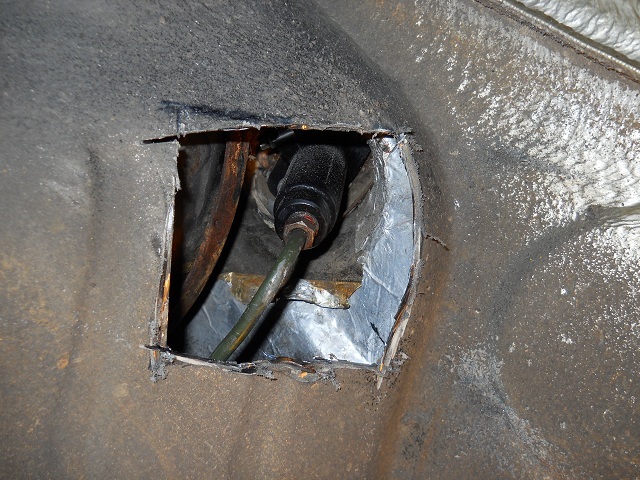 Its a little hard to see in these images but there is a bump formed in the inner fender that is for clearance of the master cylinder line. I used that as my reference point and sketched a hole big enough to get a hand into the area of the clutch master cylinder. If you should ever be crazy enough to try something like this, be careful not to plunge through the steel and nick the line. That actually turned out pretty good as far as centered over the master cylinder. Its better to be lucky than good. 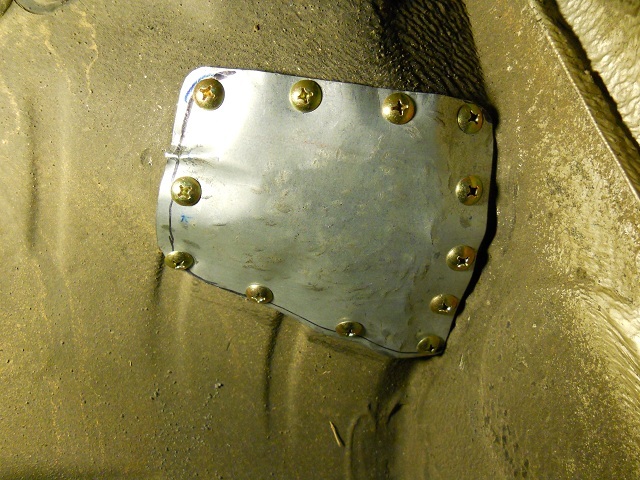 Then I dug out sheet metal some screws and made a simple cover plate. 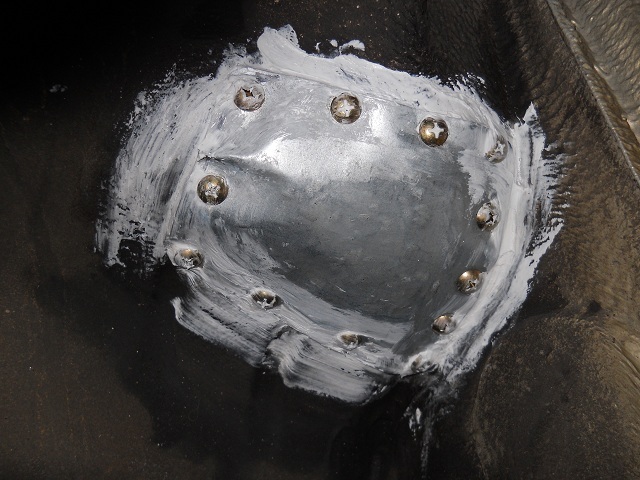 I did a little forming of it and that would have gone better if I had started with some thicker steel. This thin galvanized stuff was easy to trim, so I went with it. Some old school seal sealer (that every body man has). I couldn't find the right color to match that Texas dust color (which btw is on every part of this car), so had to use standard rattle can black - I may have been in the tiniest hurry to quick close this up before anyone saw I had cut a hole in my Porsche. For now, back to the install.